NRA Blue Eagle poster, the image most commonly associated with the NIRA. When Franklin Delano Roosevelt was inaugurated in March 1933, one quarter of the nation’s work force, (representing approximately 13 million workers in the United States), was out of work. This was in the midst of the Great Depression, and even those fortunate enough to have jobs worked under unfavorable conditions. Overproduction in the 1920’s led to inflation, and in 1929 the Wall Street Crash flattened the United States’ economy. This infamous catastrophe resulted in a level of production in 1933 significantly less than what it had been just four years earlier. The National Industrial Recovery Act of 1933 (NIRA) was one of the most important and daring measures of President Franklin D. Roosevelt’s New Deal. It was enacted during the famous First Hundred Days of his first term in office and was the centerpiece of his initial efforts to reverse the economic collapse of the Great Depression. NIRA was signed into law on June 16, 1933, and was to remain in effect for two years. It attempted to make structural changes in the industrial sector of the economy and to alleviate unemployment with a public works program. It succeeded only partially in accomplishing its goals, and on May 27, 1935, less than three weeks before the act would have expired, the U.S. Supreme Court ruled it unconstitutional. Economists, scholars, politicians, and the public at large were deeply divided as to the underlying causes of the Great Depression and the best means to bring it to an end. In the months following Roosevelt’s inauguration, his advisers, along with members of Congress and representatives from business and labor, drafted the legislation that was introduced in Congress on May 15, 1933, as the National Industrial Recovery Act. The division of opinions about the Depression was reflected in those who drafted NIRA, and the act drew both praise and criticism from across the political spectrum. Nevertheless, the urgency of the economic situation (with unemployment exceeding 30 percent in many parts of the country) pressured Congress to act. 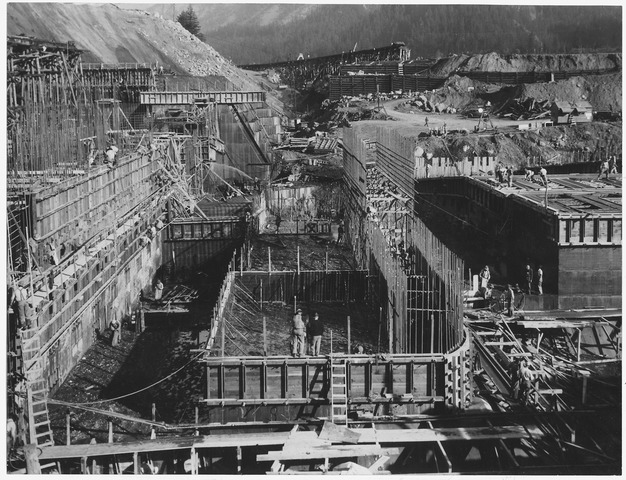 Public Works Administration Project and U.S. Army Corps of Engineers constructing Bonneville Power and Navigation Dam in Oregon. The House of Representatives passed NIRA by a vote of 325 to 76. When it reached the Senate, however, several powerful senators opposed the bill. Some favored alternative legislation authored by Alabama Senator Hugo L. Black (who Roosevelt would appoint to the U.S. Supreme Court in 1937), which promoted a thirty-hour work week. Some Senate progressives preferred other alternatives to NIRA. Many conservatives opposed any increase in federal powers that would result from NIRA or from other relief measures. Finally, some senators were troubled by the fact that the act suspended the enforcement of antitrust laws at the same time that it called on businesses to play a major role in drafting “codes of fair competition.” Given the benefits that business was expected to derive from NIRA, New York Senator Robert F. Wagner, who had helped draft the bill, insisted that it provide a guarantee of collective bargaining for labor. That guarantee was contained in section 7(a) of title I and proved to be the most enduring legacy of NIRA. The Senate eventually approved the bill by a margin of seven votes. NIRA was divided into three sections, or titles. Title I promoted centralized economic planning by instituting codes of fair competition for industry. Title II provided $3.3 billion for public works projects. Title III contained minor amendments to the Emergency Relief and Construction Act of 1932 (47 Stat. 709). Title I of the act declared a “national emergency productive of widespread unemployment and disorganization of industry, which burdens interstate and foreign commerce, affects the public welfare, and undermines the standards of living of the American people.” To correct this situation, NIRA proposed to “remove obstructions to the free flow of interstate and foreign commerce … to eliminate unfair competitive practices … to increase the consumption of industrial and agricultural products by increasing purchasing power, to reduce and relieve unemployment and to improve standards of labor.” NIRA was to accomplish these goals through the codes of fair competition, which were essentially sets of rules created on an industry-by-industry basis governing wages, prices, and business practices. The codes were intended to arrest the downward spiral of the economy in which high unemployment depressed wages, which decreased public purchasing power, leading to lower prices and profits (as desperate businesses tried to undersell one another), putting further downward pressure on wages. It was hoped that organized cooperation between business and government would correct what was perceived by some to be waste and inefficiency in the free-market economy. The NRA began to work with businesses to establish the mandated codes for fair competition, which were to be exempt from the antitrust laws. Cooperation to this extent among competing businesses would ordinarily be prohibited. Industrial groups first submitted proposed codes to the president for his approval. The president was to approve the codes only if the submitting organization did not restrict membership and was representative of the industry and if the codes themselves promoted the policy of the act. Codes were to neither foster monopolies nor discriminate against small businesses. Once approved, the codes became legally enforceable standards for that trade or industry. Under section 3(c) of the act, federal district courts had jurisdiction over code violations, and U.S. district attorneys were given authority to seek court orders to compel violators to comply with the codes. Section 3(f) provided that any violation affecting interstate or foreign commerce was to be treated as a misdemeanor for which an offender could be fined not more than $500 for each offense; each day during which a violation occurred was to be regarded as a separate offense. Under Section 7(a), industry codes were required to include provisions for the protection of labor. Provisions for minimum wages and the right to collective bargaining were to increase workers’ deflated purchasing power, and limits on number of work hours were to increase employment by spreading the available hours of work among more employees. Section 7(a) also provided that an employee must not be required to join a company union or be prevented from joining any other union as a condition of employment. Section 7(a) was to have such far-reaching consequences that some labor historians have called it the Magna Charta of the labor movement. Nationwide, union membership grew dramatically. The Amalgamated Clothing Workers, for example, doubled its membership from 60,000 to 120,000 between early 1933 and mid-1934. The United Mine Workers of America quadrupled its membership, from 100,000 to 400,000, less than a year after passage of NIRA. Photo: Records of the National Recovery Administration [NRA], 1927-1937; Records Group 9 (NWDNS-9-X); National Archives. Under the supervision of the NRA, several hundred industry codes were rapidly enacted, but public support soon diminished. The codes tended to increase efficiency and employment, improve wages and hours, prevent price cutting and unfair competition, and encourage collective bargaining. However, they also tended to raise prices and limit production. Businesses found the codes burdensome. More than 540 codes were promulgated, and it was not unusual for one business to be governed by several, or even several dozen, codes. The codes sometimes conflicted with each other, and businesses occasionally had to pay their workers different rates of pay at different times of the day. Moreover, labor was dissatisfied with the activities of the NRA regarding unions. Although it appears that Congress had intended Section 7(a) of NIRA to assist employees in self-organizing and in discouraging company unions, the NRA interpreted the section in a manner that favored neither labor nor management. Thus, although the NRA sought to ensure that the government protected workers from discrimination resulting from union membership, it did not actively seek to prohibit the creation of company unions, nor did it satisfy many in its efforts to protect the right of individuals not to be coerced into joining a union. In spite of some NRA successes on behalf of labor—it ended child labor in the textile industry—many in the labor community alleged that the NRA’s interpretation of the labor provisions favored employers. Regardless of the NRA’s intentions in any given case, few staff members were available for enforcement, and codes were often easily manipulated or avoided. Title II of NIRA created the Public Works Administration (PWA) to award $3.3 billion in contracts for the construction of public works. (The government did not directly employ workers on PWA projects, as it did in a later New Deal program with a similar name, the Works Progress Administration (WPA).) Secretary of the Interior Harold L. Ickes ran the PWA. Ickes was scrupulously honest in choosing projects and awarding contracts, and he insisted that funds not be wasted. He was successful in that respect, with the result that the benefits of the public works provisions of NIRA were realized too slowly to have much immediate effect on national recovery. Nevertheless, the PWA did oversee an enormous number and variety of public works projects, including schools, hospitals, post offices, courthouses, roads, bridges, water systems, and waste treatment plants. Its two most prominent projects were the construction of the Triborough Bridge in New York City and the completion of the Boulder (now called the Hoover) Dam on the Colorado River in Arizona. Ultimately the PWA completed more than 34,000 projects around the country. In spite of the gradual success of the Public Works Administration, the NRA continued to lose the support of the public and its government sponsors. Three weeks before NIRA’s two-year expiration date, the Supreme Court unanimously declared it unconstitutional in Schechter Poultry Corp. v. United States, 295 U.S. 495, 55 S. Ct. 837, 79 L. Ed. 1570. The Court held that the act impermissibly delegated legislative power to the NRA and that the application of the act to commerce within the state of New York exceeded the powers granted to the federal government by the Commerce Clause. (The Commerce Clause gives Congress the power to regulate commerce between states, but not within an individual state.) In response to Schechter and to other decisions invalidating New Deal legislation, Roosevelt delivered a famous speech on May 31, 1935, in which he criticized the Supreme Court for employing “the horse and buggy definition of interstate commerce.” Subsequent New Deal legislation incorporated some elements of NIRA, most notably the labor provisions of Section 7(a), and ultimately survived the scrutiny of the Supreme Court. This 1933 New Deal-era promo for the NRA (National Recovery Administration) may also be watched through the Internet Archive. The collapse of Reaganomics is making people rediscover the value and intent of FDR’s New Deal. With the usual 20/20 hindsight available to us, the best parts of the New Deal should be reinstated. Obviously, we don’t want the AAA. Bring back Frazier-Lemke Act, with an amendment to protect primary residences valued at and under the median house price, from foreclosure and eviction. If ANY judge will approve a payment plan proposed by the homeowner to pay the mortgage within his/her means, then the bank must accept it and prohibited from levying penalties. Furthermore, the terms of the amendment must survive any transfer of the mortgage to another lender. We’ve given Big Business a 35-year unabated reign over the masses and the verdict is in. Guilty of criminal negligence, criminal mischief, betrayal of trust, and treason. If Corporations are people, then it follows that they ought to have a limited lifespan! I propose a 60-year lifespan and that a malfeasant corporation can have its life taken from it by government dissolution of its charter, including arrest of the CEO and his/her associates. Only a socialist, communist, or someone not knowledgeable of the open market would suggest such a thing!